How can child welfare agencies improve outcomes for children and families? A group of policy, practice, and research experts at Chapin Hall is answering that question in jurisdictions across the country. Chapin Hall’s Implementation Collaborative works closely with child welfare leaders, staff, and partners to determine system needs and co-design solutions. The Implementation Collaborative was created in 2014 with support from Casey Family Programs. Partner jurisdictions have included Tennessee; Maryland; New York City; Harris County, Texas; the California counties of Los Angeles, Alameda, and Santa Clara; and the District of Columbia. In one jurisdiction, we developed a child well-being dashboard to help case workers track functional assessments and service delivery. In another jurisdiction, we are using predictive analytics to determine family needs and improve the allocation of resources for families in greatest need. And in one state we are co-creating and implementing an integrated practice model that defines and operationalizes the agency’s values, practice principles, and core strategies. 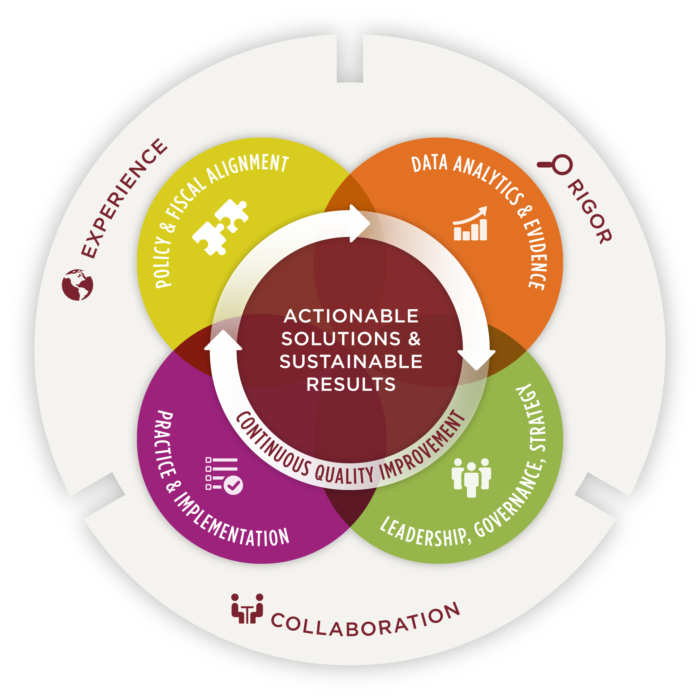 In all of the jurisdictions where we work, we promote effective continuous quality improvement structures and processes. This work at Chapin Hall is led by Policy Fellows Clare Anderson and Krista Thomas. Clare is the former Deputy Commissioner of the Administration on Children, Youth and Families at the US Department of Health and Human Services. Krista served more than 10 years in the Children’s Bureau at the US Department of Health and Human Services Administration for Children and Families. Clare and Krista lead teams of Chapin Hall staff with a mix of real-world experience and in-depth knowledge of what works in child welfare system improvement. Contact Anderson or Thomas for more information about the Implementation Collaborative work.